iRobot Roomba 780 vs Roomba 535 Showdown! Continuing our in-depth coverage of the iRobot Roomba 780 robot vacuum cleaner, I would be remiss in not comparing a Roomba 700 series to a 500 series. 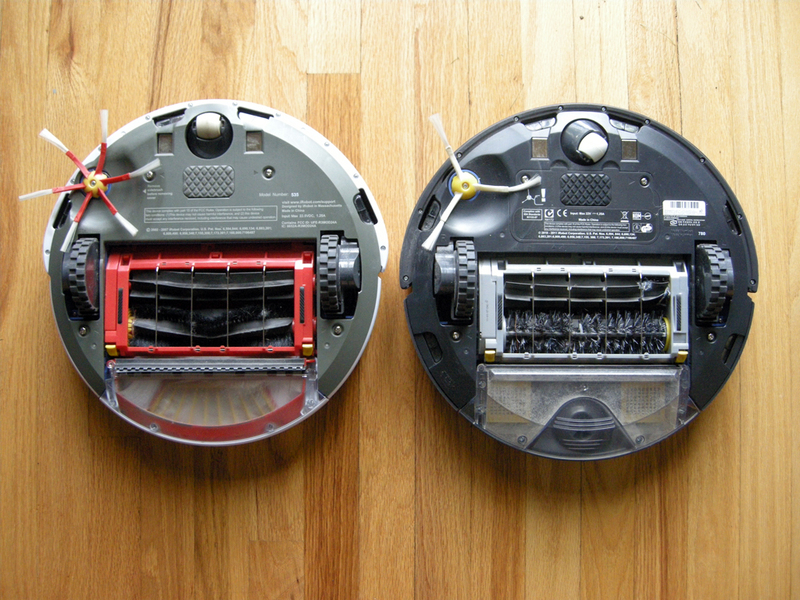 In particular, we took both robots and had them vacuum the same room, one after the other, the same way we did in our Mint Cleaner vs Roomba 700 Series comparison. I should also note that there is already some information comparing the 500 Series and 700 Series Roombas, here in our 780 review. So let’s get down to brass tacks and talk about the differences between the two robots. On the left is a Roomba 535. One of the biggest differences is that all the 700 Series robots have on-board scheduling. As mentioned elsewhere, the 760, 770, and 780 have a new cleaning head designed to pick up finer particles, AreoVac Series 2 dust bins which have better suction, and a 50% longer battery life. In the 770 and 780 only, there is a new improved Dirt Detect feature and a bin full indicator light on the top of the robot. The 780 has a touchpad control instead of buttons on the top. As you can see in the photo above, the 780 has two more cliff sensors behind the drive wheels, for a total of six. This enables the robot to back up, which is something that the 780 does and the 535 doesn’t do. In fact, I’m pretty sure that this is entirely new to the 700 Series robot vacuums. When the Dirt Detect kicks in, they do a spot clean, and unlike earlier Roombas, which circled around a dirty spot, the 700 series actually runs back and forth over the spot. Another new feature that is easy to overlook is that the battery has a door. On the 535, you have to take the whole bottom off of the vacuum to get to the battery. On the 780, there is an easy to open port. You’ll also notice that the side brushes are different. The 535 has six arms while the 780 has three. I did not notice any real difference in performance between these two brushes. Here they are with the bottoms taken off. Again the 535 is on the left. As mentioned in the 780 review, the cleaning head has been redesigned. It has been my experience so far that it collects less hair around the beater bearings. 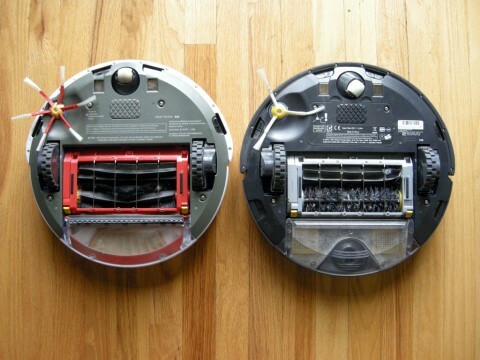 The cleaning head in past Roombas has been something of a magnet for controversy because it has a gear box on one side which is designed in such a way that it’s not completely sealed. So some of them may slowly collect fine debris inside, and as such eventually it may have problems or need to be replaced. The jury is still out on whether or not this will continue to be a problem with the 700 Series, but a careful look at it reveals that some changes have been made to the design. Only time will tell whether or not this will make a difference. 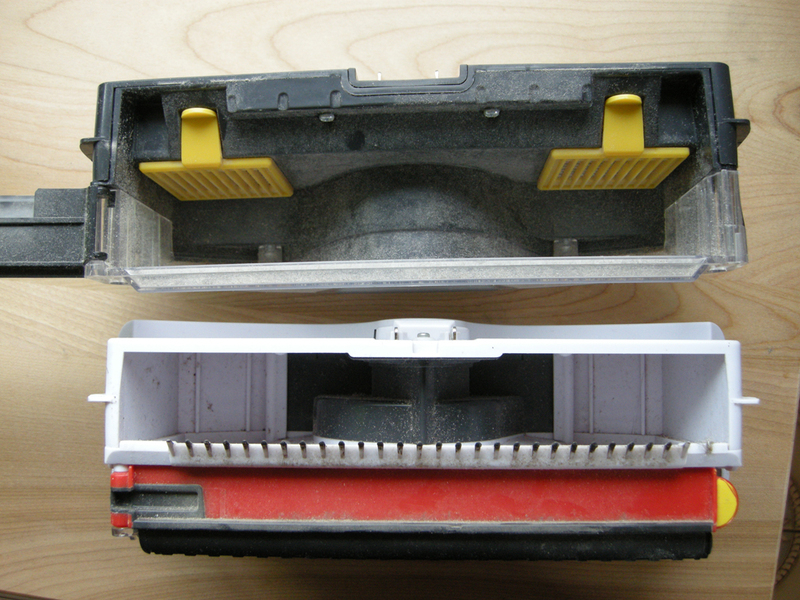 The battery, side brush component, wheels, and even the cleaning head all appear to be interchangeable between the two robots. The caster wheels appear to be identical. I was able to pop all the modules all out of one robot, and then insert them into the other. I wasn’t brave enough to turn them on with the parts exchanged, but I did note that the side brush unit has identical part numbers on the circuit board. 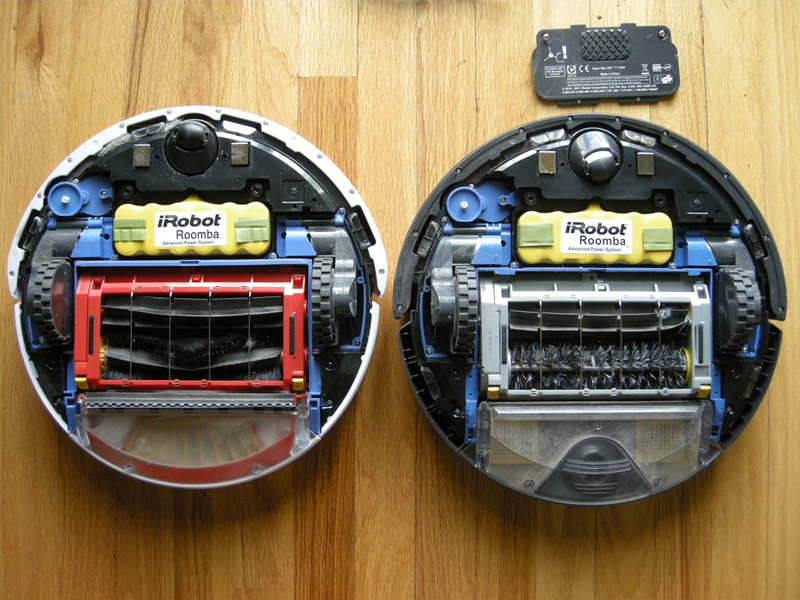 The wheel units appear to be identical with the exception that the newer wheels lack a hole that is in the older ones, and are labeled L and R.
The batteries for these two Roombas appear to be the same but have different part numbers. 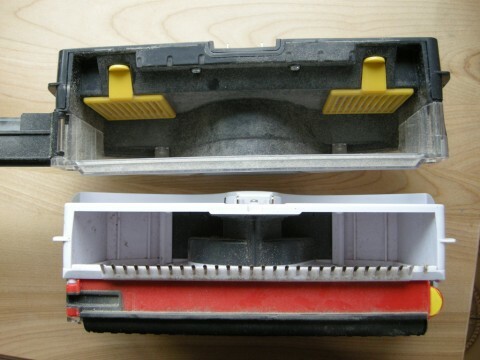 On the 500 Series, the battery is part number UNH071113 0740. On the 780, the battery is labeled “Model 3000”. Both are APS (Advanced Power System). Both are Ni-MH. Both appear to be made of the same number of cells. The Model 3000 is listed on iRobot’s site as having 3000 milliampere-hour (mAh). I’ve done a little research on the other battery and can only assume that it is the same. As mentioned above, the 700 Series Roombas have a new suction and bin component, called “AeroVac Series 2.” This new one is the top bin pictured here. The new bins are one single chamber with two HEPA filters on the top. When you really look at them with an eye towards comparison, it’s a little bit hard to tell which bin can hold more, because the older bins have an extra compartment on the bottom. Of course, this is the area that the smaller particles end up in, so it doesn’t really fill up as much, at least in my experience. If you consider them side by side, though, it does look like the newer one will hold more debris. The newer bin is easier to clean. You just knock it out, and then pull out the two filters and knock them out. With the older bins, you have to knock out the top, then open the bottom and knock it out, and then pull the filter out of the bottom and knock that out. The filter in the older ones is kind of fiddly with getting it put back in. It’s not a huge difference, but it’s noticeable. When running the robots, they both seem equally loud. The Roomba 780 sounds a little different on carpet, like the beaters are working harder or something. It also appeared to me, just from watching the two robot vacuum cleaners in action, that the 780 did a better job of seeing objects in its path and slowing down before bumping into them. In other words, the 535 plowed into more furniture at full speed than the 780 did. Something interesting did happen when we first ran the 780 on one of our carpeted rooms, though. It looked to us like the carpet was cleaner than we could remember having seen it in a long time. We decided that further testing was required. So we set up our living room as a test area. This included scattering some extra dirt and lint around to give the robots a good test. 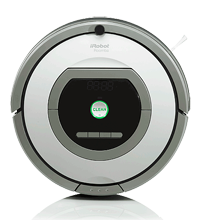 We ran the 500 series Roomba first, and then followed it up with the 700 series robot. The we did the same thing but backwards in another room in the house. 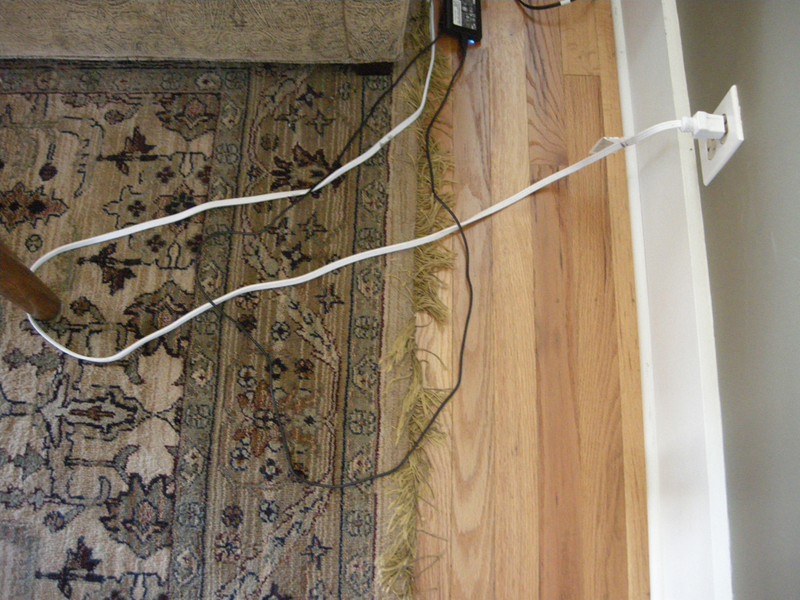 In the living room test, we also set up a small area with some cords to see if either robot would get stuck, or if they would run off with any of the cords. The living room area is about 150 square feet and has a large area rug in the center. It also has an entertainment center, a dining table, a cabinet, a couch, and an easy chair. It needs to be noted that both robots were run with new batteries, but the 535 has an old filter, even though I spent some time cleaning it out before this test. So the 500 Series has a little handicap. And here are the results from the 535 cleaning the living room. It took an hour to complete the room, and did a decent job of cleaning. There were a few visible fuzzies left in the carpet that the cleaning head didn’t seem to be able to pull out of the pile. The Dirt Detect light came on when it went over some of the dirty areas we had set up for the test. The 535 got kind of tangled in the cable trap, but made it out OK, and didn’t pull anything out after it. (I do have to say that this robot does have a reputation for getting tangled up in cords and once somehow managed to topple a floor lamp.) So as you can see, after cleaning the room, the dust bin was maybe a third full in the top, and there was some fine dust in the bottom chamber of the bin. Then we ran the Roomba 780 in the same room, right after we ran the 535. The 780 finished the room in 45 minutes, which was 15 minutes faster than the other robot vaccum. Also, I noticed that the 780, when doing the rug, kept finding dirty spots. 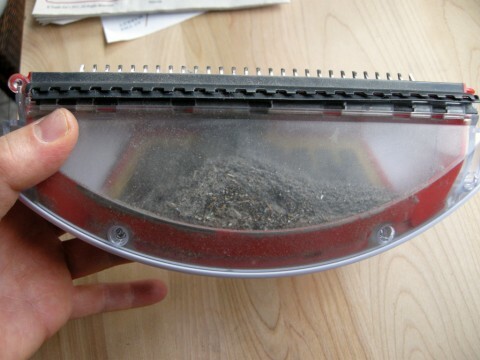 So the Dirt Detect light would go on, and the Roomba would go over the same spot a couple of times. I counted this four different times, and thought that it was pretty interesting, considering that the 535 hadn’t found any Dirt Detect areas on the rug. 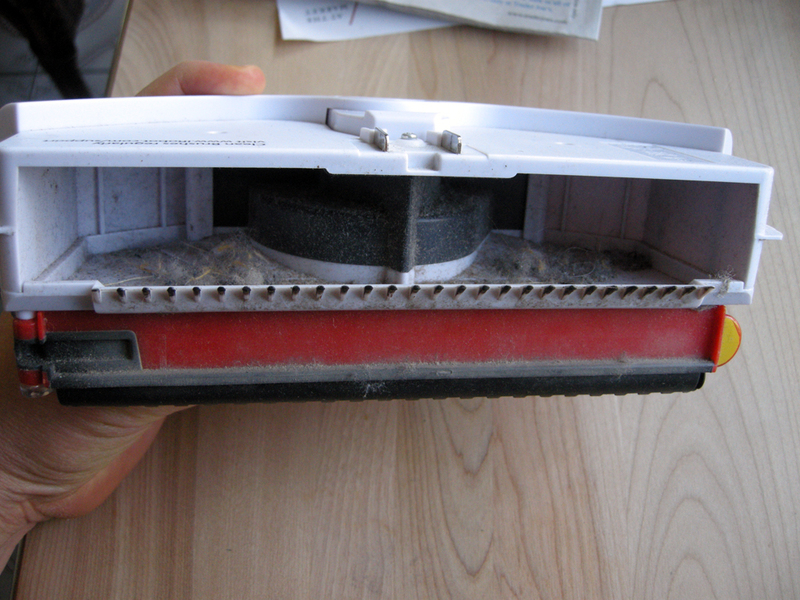 Also, as noted above, the 780 Roomba sounded like it was really doing more with the beaters on the rug. So how did it do? Wow! 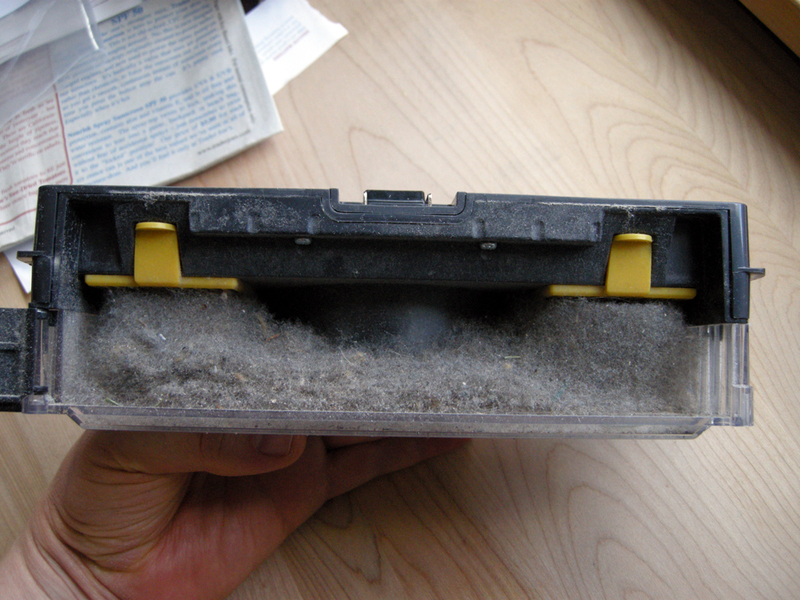 I was really shocked to find that the 780’s dust bin was completely full! Check this out. We ran this robot after the 535 had cleaned the floor, and there was actually more debris in the dust bin than was in the 535. We discussed the results and thought that maybe our carpet is an endless supply of lint and dirt. So of course the 780 would come up with some more dirt. But that doesn’t explain why the 780 would come up with more dirt. So we ran the 535 again. And it basically came up with lint. Not satisfied, we ran the same test in a another carpeted room, except that in that room we ran the 780 first and then followed it up with the 535. I’m not going to post the photos from that one, but again, we found that the 780 picked up more debris, although the 535 found plenty too, it wasn’t as dramatic a difference. So there you have it. It looks like the iRobot Roomba 780 is a real upgrade from a 500 Series robot vacuum cleaner. 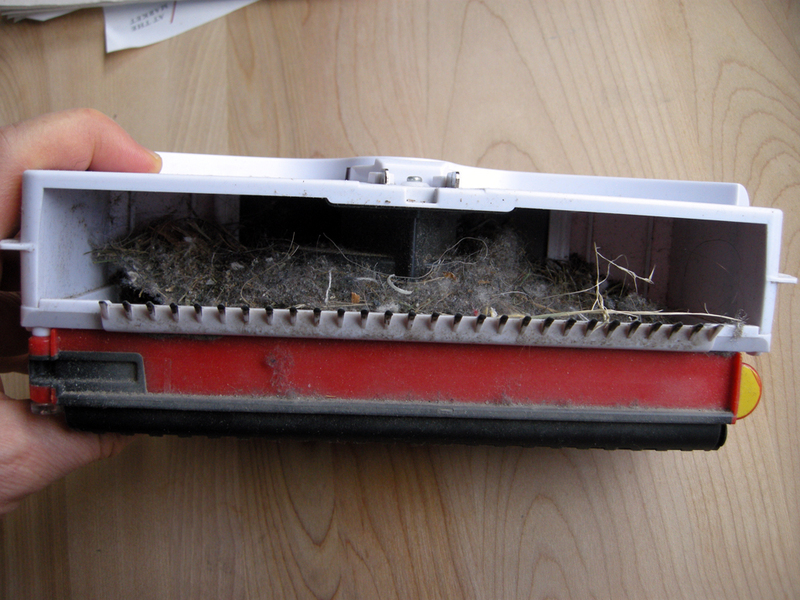 So if you’re trying to decide if you should spend the extra money on a newer Roomba, the answer is: Yes. thank you so much! My husband and have been trying to decide whether to upgrade (our old 500 has died) and your review was just what we needed to make an informed decision. What is the heigt of the Roomba 780? Is it still 8 cm. Does it go unter a cabinet of 10 cm? The 780 is basically the same height as a 500 Series. The robot itself is about 3 inches high, and has a bumper on the top that’s about a half inch. So I would want about 3.5 inches or 10 cm for clearance. So it’s going to be close! Hope this helps! Hello, I tested 500s roomba for few days. Unfortunatelly, it stucked several times on small egde under door-window (doorsill). 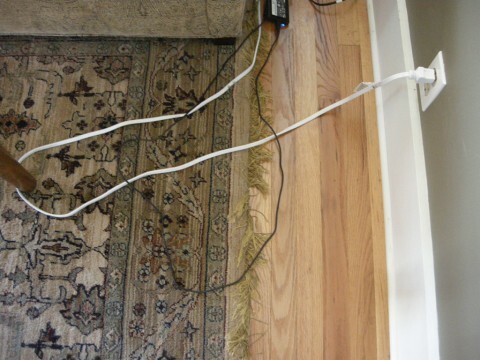 Has 700s roomba improved this – edge climbing? Thanks. If it was happening with a 500 Series, I would expect the same from a 700 Series, unfortunately. Maybe there’s something you can do to keep the robot from going into that area? The fewer arms on the side brush makes it so it doesn’t get caught on area rugs as easy. With the 500 series design if the roomba doesn’t cross the area rug at the correct angle the side brush will often run under the rug and force the roomba to follow along the edge of the rug until it turns or gets to the other end. I noticed it didn’t do this nearly as often after one of the arms on the side brush of my 500 series broke off. Guess they noticed too! I am trying to decide between the 770 and the 780? Have you looked at the differences between those models? The only thing I can tell by reading the specifications is the buttons. If you have this information please let me know. Thankyou.